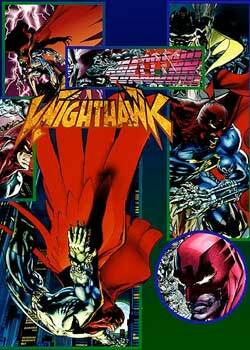 KNIGHTHAWK- Genetically near-perfect. Scott Pike is a clone of a hybrid. His twin “brother” is a pilot. Aliens genetically altered his brother to save his unborn life. 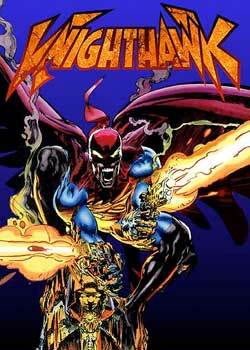 As a byproduct, he grew primitive, muscular, featherless wings... As did his clone. The clone, Scott, invented artificial wings for flight, and freed his soul. Now this brilliant young scientist studies and works and at night... He seeks to make right... man’s inhumanity to man.